Hard At Play has been turning dreams into reality since 1989! Whether you’re planning the wedding of a lifetime, or a party to top all parties, we will combine your vision with our years of experience to create the perfect atmosphere! Hard At Play’s single goal is to make that important event all it can…and should be! We know that it takes more than just good music to make your event a success so by taking the time to listen to your ideas and share in your vision, we’ll create the right plan together. From the first beat to the last, your professional Disc Jockey and Master of Ceremonies not only has the experience to get the dance floor going, but the tools and enthusiasm to keep it going. We can be as interactive or conservative as you prefer and always maintain a volume of music appropriate for all of your guests. Never at anytime will we sing, shout, make unnecessary remarks over the microphone, wear any type costume or ask you or your guests to wear one, or play any type of game that would only be appropriate at a grade school dance. When you pick the right entertainment professionals, you are investing in “peace-of-mind.” Long before your first dance is played, Hard At Play will give you the confidence that your event is in the right hands. 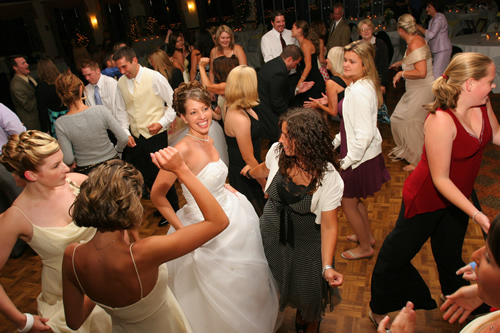 Instead of gimmicks, we’ll use a couple’s song selections and our ability to read the crowd to play the right songs at the right time to create an atmosphere that will be enjoyed both the couple and their all of their guests. Whatever ideas you may have about your event… we would like to help make it happen for you. Thank you for considering Hard At Play. We encourage you to sit down with us and discuss all of your entertainment needs personally.